Women are thoughtful. For most Jewish women Chanukah means buying something for someone else; for her parents, her partner, her children, and even her boss. 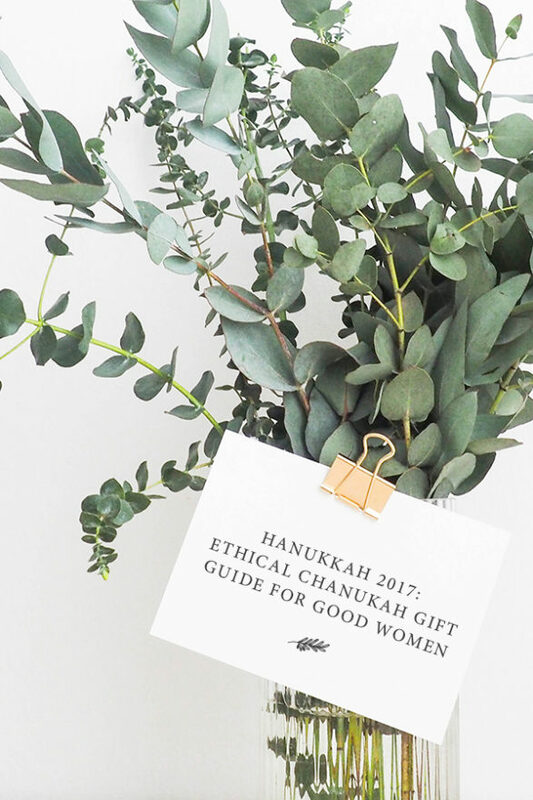 In this gift guide for women I wanted to give ethical gift ideas to delight woman for Hanukkah. In this guide you will find varied products of different price points. The thing they have in common is that they are made by companies whose mission is ethical. Vrai and Oro– The gift of jewelry is classic, ensure that you are gifting your loved ones ethical and responsibly sourced jewelry. Vrai and Oro have a selection of elegant, simple pieces and ensure the cost of the jewelry reflects the craftsmanship of their work, without the jeweler’s typical markup! Kishe Coffee– Do you have a coffee lover in your life? Gift them beautiful high-quality, sustainable Guatemalan coffee beans. Kishee coffee aims to embrace organic agriculture while providing financial stability to Guatemalan farmer families. Pick between the Volcan, Woman, or Reserve beans each with their own unique attributes both ethically and in the roast of the bean. Maine Sea Salt– Maine Sea Salt was founded by a loving couples passion for food. This is a beautiful, natural process, Kosher sea salt straight from Buck’s Harbor, Maine. The salt water is taken from the harbor and evaporated in shallow pools creating natural sea salt that does not contain any drying agents. Hu Chocolate– This amazing chocolate was born out of self discovery and the slippery slope of asking, what’s really in our food? Hu Chocolate contains no additives, preservatives, gums, refined sugars, or any of the typical ingredients you find in regular processed chocolate. Give the gift of something that tastes so good they won’t believe it’s also good for them. Crystals– Kacha Stones focuses on providing ethical, hand mined crystals working closely with individual miners that they’ve shared relationships with for years. These beautiful crystals are consciously stored in a way that prevents unwanted energy being picked up by the stones until they make their way to your recipient. Nicely Noted– For the writer in your life this monthly stationery subscription could be just the perfect thing. Each month they will receive beautiful letterpress cards fit for every occasion. These simple designs allow the writer to speak from the heart and send along a cards whenever they need to, without an added trip to the convenience store. Seed + Mill Halva – We all eat sweets during the holidays so giving healthier sweets is more supportive for women. Halva is made from nutritious sesame seeds. Seed + Mill offer a gluten-free, kosher and vegan halva that is divine! Their selection includes traditional halva varieties like marble, pistachio or rose oil. They also offer more unique flavor combinations like white chocolate & lemon, ginger, cardamom or sea salt dark chocolate. Sabonato Soap- What touches our bodies is important and most women I know like to use natural products in the shower or bath (we want to feel clean in that organic sort of way). The Keshet family takes special pride in its all natural soap. Each bar a fusion of pure, high quality oils, authentic Dead Sea mud, salts and minerals, and organic, fragrant plants. The soap has “good vibrations” and gives you a healthy washing experience that cleanses the body and awakens the soul with its intoxicating scents. One of these knives!– I personally own one of these beautiful knives and I would love to give it away to one of you. Keep an eye out for our December blog post where I’ll have a link for you to enter a drawing to win one of these knives. Crafted from fine carbon steel with bog oak handles these knives have a rustic feel with the pleasure of being artisan made. P.S. I created a Hanukkah 2017: Non Tech Hanukkah Gift Guide for Calm Kids right here.